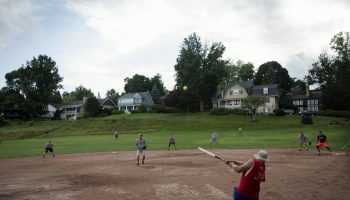 Early evenings on Mondays and Wednesdays, Sharpe Field belongs to a quirky group that loves to play softball. 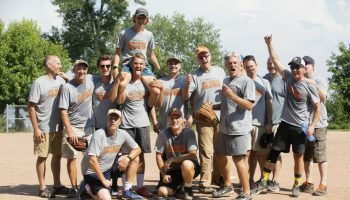 Men of varying ages gather with silver bats in hand, excited about another game in the long-running league. People sit in the grandstand outside the field to cheer on their family and friends. It’s July 12, and excitement fills the air, yet so does skepticism. The forecast calls for rain and Mark Altschuler, commissioner of the league, asks if both teams still want to play. Small droplets of rain begin to fall, but neither team has any interest in skipping the seven-inning game. “Play on,” a voice from the field calls out. As soon as the game starts, the rain stops. It’s as if Mother Nature listened to the ominous voice and ceased her shower. The day’s game is between the Slugs and the Arthritics. 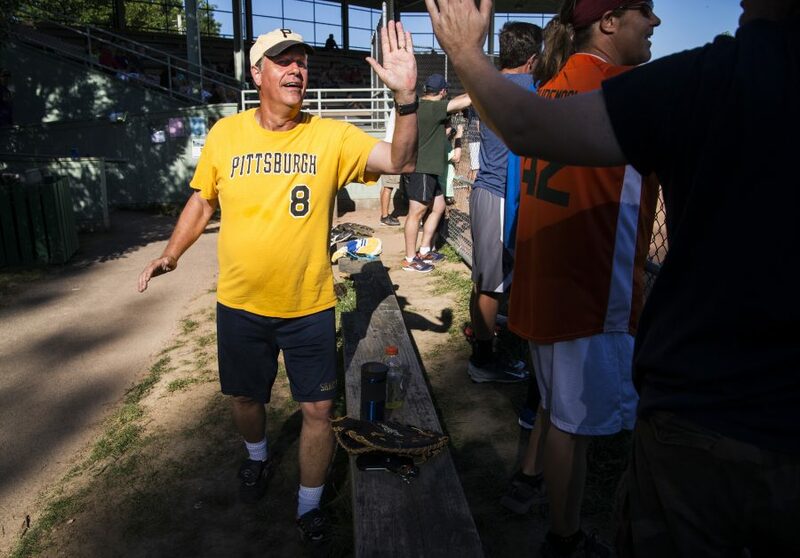 The Slugs, captained by longtime pitcher Danny Miller, are in first place in the league at 3-1. The Arthritics, captained by Altschuler, sit at 2-2, but have confidence after beating last year’s first seed, the Pounders, earlier this season. The teams couldn’t be more different. 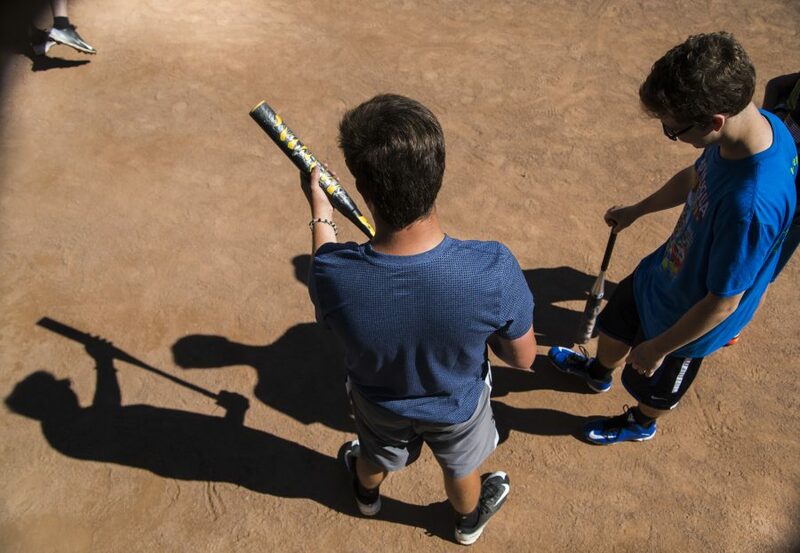 The Slugs have a set roster filled with brothers, sons and fathers. The Arthritics have a revolving door of players. 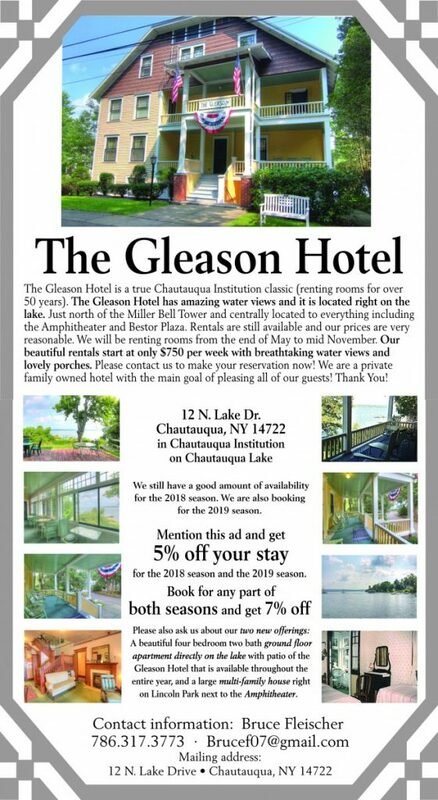 They are built for vacationers and visiting friends. They welcome everyone to play, regardless of skill level. The Slugs explode on offense immediately. Father and son John and Nate Chubb score early, giving the Slugs a 2-0 lead. The Arthritics look on without fear. They have an ace in the hole. Will McEvoy, a relative of Doc Sharpe — after whom the field is named — once competed in collegiate level baseball until an injury ended his career. 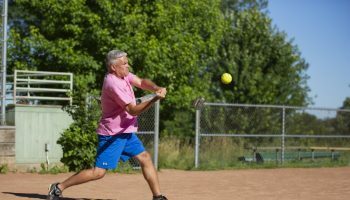 He’s only in Chautauqua for a couple weeks, but didn’t want to miss out on the softball league, which he played for consistently during his adolescence. Danny Miller’s first pitch to McEvoy is the only one he needs. McEvoy blasts the ball past the grass field into the rough yellow weeds for a home run. The Slugs maintain the lead at 2-1 going into the second inning. Superb fielding keeps the score the same going into the fourth inning. Greg Miller hits the ball to deep right center field, where it proceeds to bounce into the weeds, forcing a ground-rule double. His double brings home Dave Anderson and Danny Miller, his brother. 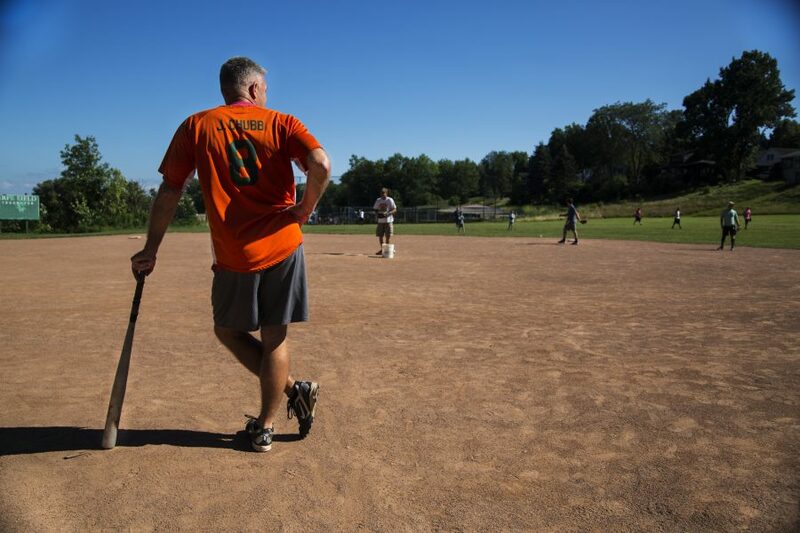 At 5-1 in the top of the fifth inning, the game’s starting to get away from the Arthritics. With the pressure mounting, Aaron Weintraub steps up. A double down the third baseline sets up McEvoy, who ropes a double into mid-center field, bringing Weintraub home. Then, John Steere singles to right field, plating McEvoy. Steere scores off a single from Jon Eig. All of a sudden, the momentum has shifted. The Slugs still have the lead, but there’s some frustration on the bench. 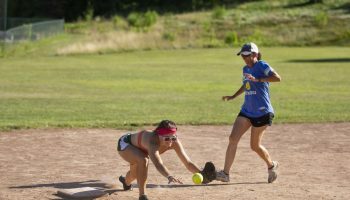 There’s been an influx of parity between teams in the league this season, and the Slugs aren’t looking to fall out of first place. John Chubb paces back and forth, waiting for his chance to extend the lead and get his team some breathing room. He hits a double to left field, setting up his son Nate, who singles. The father-son duo both come home off two hits from Sean and Tyler Uber. From there, the Slugs cruise to an 11-5 win. There’s some disappointment in Altschuler’s face as his Arthritics take the loss. But that emotion quickly fades — it’s not about wins to him. After the high-fives and “good games,” some of the Slugs and Arthritics gather to play cards. They swap stories of past softball games and update one another on their lives now. For the Miller family, softball is a way to come together. During one game a few years ago, they had eight relatives playing for the Slugs. Danny, Greg and their brother Jeff, who retired last year, have played since the ’70s. From past teams like the Charlie Brown All-Stars to the Kings and Queens, they’ve seen it all. Through the shifts in teams and players, for Greg Miller, family keeps him heading down to the ballfield. But the core of the league comes from the social dynamics and the friends made during the games, something that keeps the score from being the most important aspect. 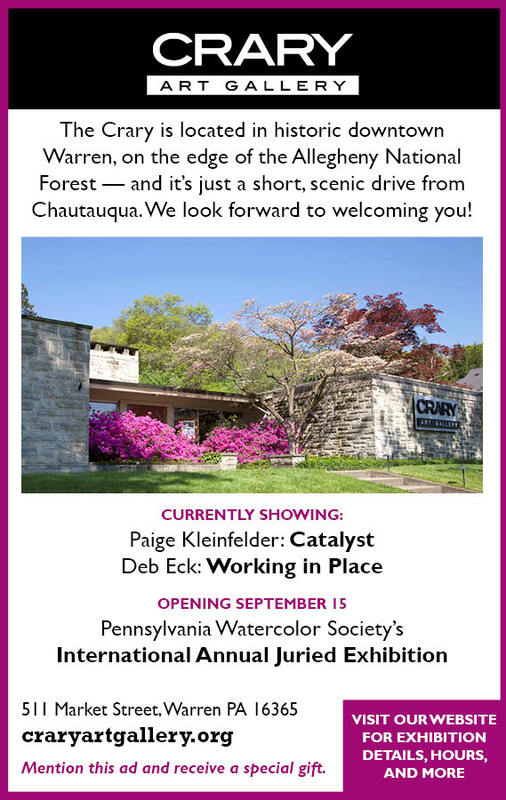 Altschuler thinks the league fits perfectly within the Chautauqua community. 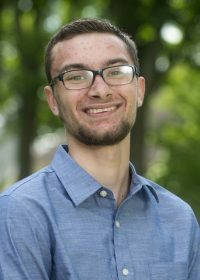 Josh Svetz is a senior at St. Bonaventure University serving as the recreation reporter for The Chautauquan Daily this summer. He’s interested in finding the larger conversation within sports and the different aspects explored inside the sports bubble. Follow him on Twitter @svetz17.